70 million customers that shop at Target had their personal information stolen in a data breach the retailer said Friday January 6, 2014. Are you scared…I am! I shop at Target and 70 million is a BIG number! The stolen data includes names, mailing addresses, phone numbers or email addresses. Along with the encrypted PIN data, Target said a few months ago that data thieves stole customer names, credit and debit card numbers, card expiration dates and the embedded code on the magnetic strip on the back of cards used at Target between Nov. 27 and Dec. 15. Ok, I am definitely worried… I AM one of the people in that 70 million, what the hell does that mean? Was your data stolen? The most recent announcement comes along with an unsuccessful holiday season for Target. Target is expecting a comparable store sales decline of 2.5%. They predicted that sales would be flat. 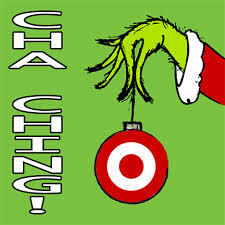 Target also revealed at the end of December that 0.1% of gift cards sold during the holidays weren’t fully activated. Although they promised to honor the faulty cards, I think the damage has been done…snafu! In addition, Target will close eight stores in May. The stores are in West Dundee, Ill.; Las Vegas, Nev.; North Las Vegas, Nev.; Duluth, Ga.; Memphis, Tenn.; Orange Park, Fla.; Middletown, Ohio; and Trotwood, Ohio. Needless to say it is not Target’s day!